Moscow, August 2014—The Read Russia Prize’s organizational committee has announced the Read Russia Prize’s global shortlist of 17 translators and translations of Russian literature into other languages worldwide. The competition, open to works published between 2014 and 2012, received 112 nominations from 16 countries around the world: Argentina, Armenia, Austria, Azerbaijan, China, France, Germany, Italy, Lebanon, Morocco, Poland, Serbia, Spain, Ukraine, the United Kingdom, and the United States. The Read Russia Prize was established in 2011 by the Institute of Translation in Moscow, a nonprofit organization dedicated to furthering the development of the theory and practice of literary translation. The competition is conducted every two years with support from the Federal Agency for Press and Mass Communication and the Boris N. Yeltsin Presidential Center. The prize is awarded to a translator or group of translators for outstanding translations of prose and poetry works from Russian into a foreign language and published by a foreign publisher during the previous two years. 3. Jorge Ferrer Diaz for his translation of Alexander Herzen’s work My Past and Thoughts (Spain). 5. Elizabeth and Robert Chandler for their translation of Vasily Grossman’s book An Armenian Sketchbook (Great Britain). 6. Marian Schwartz for her translation of Leonid Yuzefovich’s novel Harlequin’s Costume (United Kingdom). 3. Martina Jakobson for her translation of Arseny Tarkovsky’s book A Herd of Deer (Germany). Candidates may be nominated for the Read Russia Prize by publishers, professional associations, and educational, cultural, and academic organizations, as well as individuals including the translators themselves. Prizewinners in each category are the translator(s) and the publishing house that released the book. Winners receive 5,000 euros for the translator(s) and 3,000 euros for the publisher, in the form of a grant to cover expenses for the translation of another work of Russian literature, to be agreed upon with the Institute of Translation. Winners of the Read Russia Prize’s second season will be announced at the second official award ceremony in Moscow on September 6, 2014 – a highlight of the International Congress of Literary Translators. More than 300 people will take part in the event, including representatives of embassies of participating countries; staff members of foreign cultural centers in Moscow (Germany’s Goethe Institut, France’s Institut français, Spain’s Cervantes Instituto, Italy’s Cultural Institute, and Poland’s Institute of Culture); publishers; translators; literary agents; critics and columnists from leading print mass media; television and radio journalists; prominent Russian writers and poets; organizers of literary awards and competitions; and representatives from the Ministry of Culture of the Russian Federation, the Ministry of Foreign Affairs of the Russian Federation, the Presidential Administration of Russia, the Federal Agency for Press and Mass Communication, the Federal Agency for the Commonwealth of Independent States, Compatriots Living Abroad, and Rossotrudnichestvo. Members of the Read Russia Prize jury are: Vsevolod Bagno, Director, Institute of Russian Literature (Pushkin House), Russian Academy of Sciences (Russia); Grzegorz Wiśniewski, Professor, Slavist, Board Member of the Poland-Russia Society, (Poland); Vladimir Grigoriev, Chairman, Supervisory Board, Institute of Translation (Russia); Adriano del Asta, Director, Italian Cultural Institute, Moscow (Italy); Alexander Drozdov, Executive Director, Boris N. Yeltsin Presidential Center (Russia); Lu Limin, Professor, President, Chinese Association of Teachers of Russian Language and Literature (China); Alexander Livergant, Translator, Editor-in-Chief, Foreign Literature journal (Russia); Peter Mayer, President, The Overlook Press publishing house (United States); Georges Nivat, Literary Historian, Professor, University of Geneva (France-Switzerland); and Rafael Guzman Tirado, Vice President of the International Association of Teachers of Russian Language and Literature, Instructor, Department of Slavic Philology, University of Granada, Professor (Spain). In evaluating the skill of 2012-2014’s nominees, juror Rafael Guzman Tirado made particular note of several translators’ work. In this juror’s opinion, Alejandro Ariel Gonzales, Joanne Turnbull, and Nikolai Formozov, in particular, very precisely reproduced the original texts, which is very important to faithfully conveying the philosophical ideas of Fyodor Dostoevsky and Sigizmund Krzhizhanovsky. Marian Schwartz also succeeded in preserving the genre and stylistic diversity of her original text and Schwartz “has brilliant command of techniques for translating historical detective fiction.” Ives Gauthier showed great skill in revealing “historical, cultural, and everyday realities of the Soviet and post-Soviet space that are largely unknown to the general reader in other countries.” Julie Bouvard also successfully recreated a Russian cultural landscape and uses reliable and comprehensive cultural references and commentaries. Another jury member, Alexander Livergant, emphasized the academic and research character of a number of translations that are “prefaced with detailed and well-articulated commentaries as well as introductory articles.” According to Livergant, the translators are not only masters of their primary profession but also knowledgeable Slavists who have thoroughly studied the authors they work with. Members of the Read Russia Prize’s board of trustees include prominent Russian government, cultural, and public figures: Petr Aven, Naina Yeltsina, Mikhail Piotrovskii, Vyacheslav Nikonov, Kirill Razlogov, Mikhail Seslavinskii, Natalia Solzhenitsyn, and Vladimir Spivakov. The first award ceremony for winners of the Read Russia Prize took place in September 2012 at Pashkov House in Moscow. Translators and publishers named laureates of the inaugural Read Russia Prize are: Víctor Gallego Ballesteros, Spain, for his translation of Lev Tolstoy’s novel Anna Karenina, published by Alba; John Elsworth, Great Britain, for his translation of Andrei Bely’s novel Petersburg, published by Pushkin Press; Alessandro Niero, Italy, for his translation of Dmitry Prigov’s Thirty Three Texts, published by Terra Ferma; and Hélène Henry-Safier, France, for her translation of Dmitry Bykov’s Pasternak, published by Fayard. New York, NY, May 30, 2014 – Read Russia today announced the winner of the 2014 READ RUSSIA PRIZE for the best translation of Russian literature in English published in 2013: Sigizmund Krzhizhanovsky’s Autobiography of a Corpse, translated by Joanne Turnbull with Nikolai Formozov, published by New York Review Books. The annual literary prize carries a cash award shared by translator and publisher. The READ RUSSIA PRIZE awards ceremony at Lincoln Center featured jury commendations for the two other shortlisted finalists – An Armenian Sketchbook by Vasily Grossman, translated by Robert and Elizabeth Chandler, published by New York Review Books, and The Death of Ivan Ilyich & Confession by Leo Tolstoy, translated by Peter Carson and published by W. W. Norton – and a special award presented to celebrate the lifework of the late editor, publisher, and translator of Russian literature, Peter Carson. The 2014 READ RUSSIA PRIZE was awarded by Ellendea Proffer Teasley, the celebrated author, translator, and publisher of Russian literature. Teasley was co-founder, with Carl Proffer, of Russian Literature Triquarterly and Ardis Publishers, at the time the largest publishing house outside of the Soviet Union devoted to Russian literature. Jury members include Rosamund Bartlett, the writer, translator, and scholar whose new translation of Tolstoy’s Anna Karenina will be published by Oxford World’s Classics in 2014; Richard Lourie, the writer and filmmaker who has translated more than 40 books from Russian and Polish into English, works of Andrei Sakharov, Andrei Sinyavsky, and Vladimir Voinovich among them; and Ronald Meyer, the translator and editor who teaches and directs Columbia University’s master’s program in Russian translation. The holidays are a magical time when it feels like anything is possible... and these newly translated tales from a playful Soviet master are sure to transport you through the cracks of everyday reality and into the extraordinary. Join Read Russia for an intimate gathering on December 17 as we sip on inventive cocktails and celebrate the launch of Autobiography of a Corpse by Sigizmund Krzhizhanovsky, the latest literary treat from New York Review Books. NYRB Classics editor Edwin Frank and book critic and translator Liesl Schillinger will be our guides through Krzhizhanovsky's fantastic and blackly comic philosophical fables, which have been compared to the works of Poe, Gogol and Beckett. Frozen under Soviet censorship for years, his work was published for the first time only in 1989. Autobiography of a Corpse collects eleven mind-bending and spellbinding stories—the tale of a journalist who moves to Moscow to find himself engrossed in the identity of his room’s previous tenant; the fingers of a famous pianist depart the musician’s body and spend a night in the city alone; a man’s desire to bite his own elbow results in a circus act and some large philosophical ramifications—into a volume of Krzhizhanovsky’s most brilliant conceits. 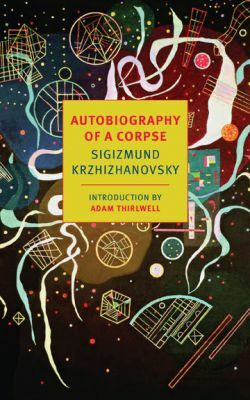 Translated by Joanne Turnbull, Autobiography of a Corpse joins The Letter Killers Club and Memories of the Future as the only works by Krzhizhanovsky translated into English, all published by NYRB Classics. *Enter through Barramundi on the ground floor, go straight to the back and ring the doorbell on the left. The Institute of Translation, under the aegis of the Federal Agency for Press and Mass Communication, will present the “Read Russia” program at the Frankfurt Book Fair. During October 9-13, the Russian stand (pavilion 5.0, stand C 136) will display around 1,000 books from more than 60 publishers from Moscow, Saint Petersburg, and other Russian regions. There will be 40 events – both at the stand and at other venues at the fair– offering opportunities to meet with Russian publishers and literary agents who sell rights for publishing Russian writers, as well as with writers themselves. The writer delegation will include Albert Likhanov, Eugene Vodolazkin, Alexander Kabakov, Marina Stepnova, Maya Kucherskaya, Aleksey Varlamov, Maxim Amelin, Marina Akhmedova, Sergei Sedov, Igor Mikhailov, Viktor Erofeev, Arina Kaledina, Elizaveta Aleksandrova-Zorina, and Nikolay Nazarkin, as well as Russian writers living abroad, including Irina Muravyova, Valerii Voskoboinikov, Victor Bejlis, Aleksei Makushinsky, Anatoly Kudryavitsky, Daria Wilke, and Dmitry Vachedin. Svetlana Alexievich, laureate of the 2013 Peace Prize of the German Publishers and Booksellers Association, will be a special guest. Translators of Russian literature will also take part in the program: Vera Bischitzky, Christiane Körner, Claudia Zecher, Annelore Nitschke, Andreas Tretner, Alexander Nitzberg, Elena Kostioukovitch, Yulia Dobrovolskaya, and many others. Literary critics, editors, publishers, and other literature specialists will participate in a series of roundtables, seminars, and presentations about new developments in contemporary Russian literature; literary awards in Russia and abroad, including the “Read Russia” prize; as well as the Institute’s grant program and the “Russian Library” project for major world languages. Participants will include: Irina Barmetova, Natasha Perova, Galina Dursthoff, Elena Shubina, Tatiana Voskovskaya, Kseniya Moldavskaya, Irina Balakhonova, Dmitry Bak, Sergei Chuprinin, Valery Dudarev, Lev Danilkin, Georgy Urushadze, Alla Gladkova, Olga Aminova, Olgert Libkin, Dmitry Likhanov, Maria Vedenyapina, Yana Kovalskaya, Wolfgang Matz, Manfred Quiring, Dmitry Antsupov, Guntram Kaiser, Balthasar von Weymarn and Olga Vaulina. The Russian stand’s children’s program will offer screenings of animated films, special “Russian Lessons,” and an exhibit of children’s book illustrations prepared by Anastasia Arkhipova, a member of the International Board on Books for Young People (pavilion 5.0 A 118, A 138). The Institute’s full program of events may be found on the Frankfurt Book Fair Web page. 9.30 – Screening of the documentary film Russia’s Open Book (free showing). 10.30 – Meet Russian-to-German translators. Welcome from Vladimir V. Grigoriev, deputy head of the Russian Federal Agency for Press and Mass Communication. Presentation of the READ RUSSIA Prize: Tatiana Voskovskaya. 11.10 – New translations of Russian classics. Ivan Goncharov’s Oblomov in Vera Bischitzky’s translation with participation of Dr.Wolfgang Matz (Carl Hanser Verlag). Moderators: Nina Litvinets. 12.30 – Let’s Get Acquainted: Publishers outside the capital and literature outside the capital. Moderator: Alexander Voropaev. 12.30 – “Dialogue” Forum. Presentation of the Institute of Translation and its program for supporting translation of Russian literature. Maria Skachkova, program coordinator, Institute of Translation. 13.40 – “How Can I Get Financial Support? The Institute of Translation’s grant program.” A workshop for foreign publishers led by Eugene Reznichenko, executive director of the Institute, and literary agent Galina Dursthoff. 14.20 – The Institute of Translation Recommends. The return of undeservedly forgotten names in Russian literature is a form of literary justice: Anatoly Mariengof, Sigizmund Krzhizhanovsky, and Vlas Doroshevich. Moderator: Natalia Perova, with the participation of writer Victor Bejlis. 15.00 – The Kniguru Prize for children’s literature presents children’s writer Nikolay Nazarkin. Moderator: Kseniya Moldavskaya. 15.30 – Women’s literature that’s not women’s literature: Maya Kucherskaya, finalist for the 2013 Big Book Award. Moderator: Elena Shubina. 16.00 – “The Russian Library” in 100 German-language volumes. The Institute of Translation meets with potential project participants, German translators and publishers. Vladimir V. Grigoriev, deputy head of the Russian Federal Agency for Press and Mass Communication, and Nina Litvinets, a member of the Institute’s Supervisory Board, will participate in this meeting. 16.15 – “Dialogue” Forum. “From Notebook To Book: What is Throwing Overboard?” Participants: Yulia Dobrovolskaya, Marina Akhmedova, Manfred Quiring, Lev Danilkin, Dmitry Likhanov, Elizaveta Aleksandrova-Zorina, and Dmitry Vachedin. Moderator: Maya Kucherskaya. 17.00 – Let’s Get Acquainted: Eugene Vodolazkin. The novel Laurus, the literary discovery of 2013. Moderator: Elena Shubina. 17.50 – Meeting of friends of the Institute of Translation. 09.30 – “The Singer of Russia’s Small Cities”. A meeting with writer Igor Mikhailov. Moderator: Valery Dudarev, chief editor of the journal Yunost, with the participation of writer Arina Kaledina. 10.15 – Glas Publishing House and the Debut Prize Present: Literature by Writers in Their Twenties and Thirties, a Discussion of Prominent Names: Elizaveta Aleksandrova-Zorina’s The Little Man, Alexander Snegirev’s Petroleum Venus, Irina Bogatyreva’s Comrade Anna, and others. Moderator: Natalia Perova, with writers Elizaveta Aleksandrova-Zorina and Dmitry Vachedin. 11.10 – The Russkaya Premiya/Russian Award in Germany. Tatiana Voskovskaya and Sergei Chuprinin will make the presentation, with participation from writer Dmitry Vachedin, an award laureate, author of the novel «Snow Germans». 11.40 – Supported by the Institute of Translation: Presentation of the novel Day of the Angel, with author Irina Muravyova. Moderator: Olga Aminova. 12.10 – “How Can You Tell a Story to Children?” A meeting with writer Sergei Sedov. Moderator: Irina Balakhonova, director, publisher Samokat. 12.30 – “Dialogue” Forum. “Contemporary Russian Literature: What’s New?” Participants: Dmitry Bak, chair of the public jury for the Big Book Award; Valery Dudarev, chief editor of the journal Yunost; Irina Barmetova, chief editor of the journal Oktyabr; Elena Shubina of Elena Shubina Editorial; Alla Gladkova of Vremya publishing house; Lev Danilkin of the journal Afisha; and Marina Akhmedova of the journal Russkii Reporter. 13.20 – The Institute of Translation Presents: Writers Maxim Amelin, Eugene Vodolazkin, Igor Mikhailov, Aleksey Varlamov, and Elizaveta Aleksandrova-Zorina, and Dmitry Vachedin. This is a unique opportunity for informal discussion. Moderator: Eugene Reznichenko. 14.20 – Big Book Award results will be announced soon! Presentation of Russia’s biggest literary award. Participants: Georgy Urushadze, general director of the award; Dmitry Bak, chair of the award’s public jury; Marina Stepnova, a 2012 award winner; and Maya Kucherskaya and Eugene Vodolazkin, finalists for the 2013 season. 16.00 – Svetlana Alexievich, winner of the 2013 Peace Prize of the German Publishers and Booksellers Association, at the Russian stand. Moderator: Alla Gladkova, chief editor, Vremya publishing house. 09.30 – Roundtable for Foreign Translators and Publishers. Literary awards in today’s Russia, from journal prizes to the Big Book Award. Moderators: Irina Barmetova and Valery Dudarev. 10.10 – The Institute of Translation Presents: Alexander Kabakov, The Old Man and the Angel. Moderator: Irina Barmetova. With participation from Elena Shubina, (AST) and Margarita Borovleva, Director and chief editor of the publishing house “Verlag Pereprava”. 11.00 – Presentation by the international project “Russia Beyond the Headlines” on new trends in Russia’s literary world. Moderator: Guntram Kaiser, Russland HEUTE newspaper representative in Germany. 12.30 – Presentation of Viсtor Erofeyev’s book Good Stalin in English translation. Moderator: Yana Kovalskaya, Glagoslav Publications. 13.00 – Presentation of Aleksei Makushinsky’s novels The City in the Valley and Steamship to Argentina. Moderator: Sergei Chuprinin. 13.30 – The Institute of Translation Presents: Writers Alexander Kabakov, Marina Stepnova, Sergei Sedov, and Marina Akhmedova. Moderator: Lev Danilkin. 14.30 – Roundtable discussion on “From Gagarin to Harry Potter: What do teenagers read in Russia now?” Participants: writers Albert Likhanov, Valerii Voskoboinikov, Sergei Sedov, and Nikolay Nazarkin. Moderator: Maria Vedenyapina, director of the Russian State Children’s Library. 15.30 – Russian Literature Overseas. “Where shall we sail?...” Writers Irina Muravyova, Anatoly Kudryavitsky, Aleksei Makushinsky, and Dmitry Vachedin will speak with writer and literature expert Victor Bejlis. 16.15 – A small person at a big war. Presentation of the novel The Unforgiven with author Albert Likhanov. Moderator: Natalia Jankova. 16.15 – “Dialogue” Forum. “Rus’ as a Metaphor.” Participants: Elena Kostioukovitch, Eugene Vodolazkin, and Andreas Tretner. 17.00 – The Institute of Translation Presents: Writer Marina Stepnova, 2012 Big Book Award laureate, and her novel The Women of Lazarus. Moderator: Lev Danilkin. 09.30 – Screening of Garri Bardin’s animated film (free showing). 10.20 – Children’s books from Russia, presented by Kseniya Moldavskaya, project coordinator, Kinguru Prize for children’s literature. 11.00 – “Russian Tales. Folk and Not So Folk.” Told by Sergei Sedov. 12.00 – “Russian Lessons” for German children about Russia’s history, language, and culture. Writer Nina Litvinets will be the teacher. 13.00 – Presentation of Anatoly Kudryavitsky’s novel The Flying Dutchman and disUnity, a collection of novellas. Participants: Olgert Libkin of Text publishing house and Yana Kovalskaya of Glagoslav Publications. 13.30 – Russian Prize laureate Daria Wilke. «Invisible iron curtain or one orbit? Сontemporary literature for teenagers in Russia and Germany: the peculiarities of the Russian market, its participants, the ratio of international and national literature, themes and taboo» Moderator: Irina Balakhonova, director, publisher Samokat. 14.00 – “The Russian Soul of ‘The White Rose’” (marking the seventieth anniversary of the execution of the Munich students) – “Die russische Seele der ‘Weißen Rose‘” (zum 70. Hinrichtungstag der Münchner Studenten). The Orenburg Publishing House. Moderator: Igor Khramov. 15.00-16.30 – “Russia Beyond The Headlines”: Discussion of “A New Trend: Book-Related Communication Spaces.” Moderator: Balthasar von Weymarn, journalist for the newspaper Russland HEUTE. Wednesday, May 22, 7:00 - 8:30 p.m.
Read Russia presents an evening of conversation with documentary filmmaker Paul Mitchell, director of the 2012 Peabody Award-winning BBC/NatGeo series Putin, Russia and the West. Paul Mitchell will discuss contemporary Russian politics and culture and the issues surrounding their portrayal through film. The evening will include screenings of excerpts from Putin, Russia and the West, Mitchell's 2002 PBS documentary on Chechnya Greetings from Grozny, and a sneak preview of Russia's Open Book, a new feature-length documentary on contemporary Russian literature hosted by actor and author Stephen Fry, due for its U.S. television release this fall. The conversation will be moderated by Eliot Borenstein, Professor of the Department of Russian & Slavic Studies at New York University and author of numerous books and articles on contemporary Russian culture and society. Paul Mitchell, born in Boston, began working in television in 1986 for ABC News Moscow. Since 1990 he has lived in the UK producing award-winning films for the BBC, Discovery Channel, Channel 4, France Télévision, PBS, and National Geographic. His films have covered subjects as diverse as the history of perestroika and rock and roll in the USSR to the fate of the orphans of Argentina's dirty war. The Death of Yugoslavia (1995) is no. 87 on the British Film Institute’s list of the 100 greatest British television programmes of any genre ever to have been screened. Mitchell's films have won the du-Pont Columbia Journalism, the Peabody, the Emmy, BAFTA, Royal Television Society, New York Festival, and the Greirson awards. Read Russia Comes to London! Read Russia events at and around the London Book Fair (Booth Y455) include writer talks, new book presentations, and a sneak preview of “Russia’s Open Book,” a feature-length documentary hosted by author & actor Stephen Fry, narrated by actress Juliet Stevenson, and directed by acclaimed filmmakers Paul Mitchell and Sarah Wallis. A co-production of Intelligent Television and Wilton Films, Russia’s Open Book brings viewers closer to the work of the most exciting authors writing in Russia today. Several of the authors profiled in the film, including Ludmila Ulitskaya, Dmitry Bykov and Anna Starobinets, are participating in Read Russia London, where they will join translators, literary scholars and publishing professionals at the London Book Fair (Earls Court Exhibition Centre, April 15-17) and around London. Featured writers include distinguished authors Oleg Pavlov and Maria Galina and Debut Prize winners Alexander Snegirev, Irina Bogatyreva. UK-based writers Zinovy Zinik, Irina Kirillova, Layla Alexander-Garrett, and Hamid Ismailov also will be presenting. Read deep! Read smart! Read Russia! Read Russia! An Anthology of New Voices (2012) is ready for your immediate PDF download and reading pleasure! Read Russia! is filled to the digital brim with English-language translations of contemporary Russian fiction and nonfiction, 445 pages of literary feats from thirty Russian writers who have conquered book award juries and the hearts and minds of millions of Russian readers. “Basileus,” a long story named for a cat, by Olga Slavnikova, winner of the Russian Booker prize for the novel 2017. Zakhar Prilepin’s “Whatever Day of the Week It Happens to Be,” the first chapter/story in Sin, a novel-in-stories that won Russia’s National Bestseller and Super National Bestseller awards. An excerpt from Alexander Terekhov’s The Stone Bridge, a historical thriller about the Stalin era that won second prize from the 2009 Big Book Award jury. “The Life and Death of Nicholas II,” an excerpt from Edvard Radzinsky’s popular history book of the same name. Please join us, we’re only a download away!